Investors are likely to lose the tax advantages that fixed maturity plans, or FMPs, have over bank fixed deposits. The Budget proposes to increase the tax on long-term gains from non-equity mutual funds from 10% to 20% after indexation.But it is not the higher tax rate that is worrying the mutual fund industry and investors but the increase in tenure for the applicability of long-term capital gains (LTCG) tax. Now, LTCG tax on non-equity funds will apply on redemption after 36 months as against the earlier period of 12 months. 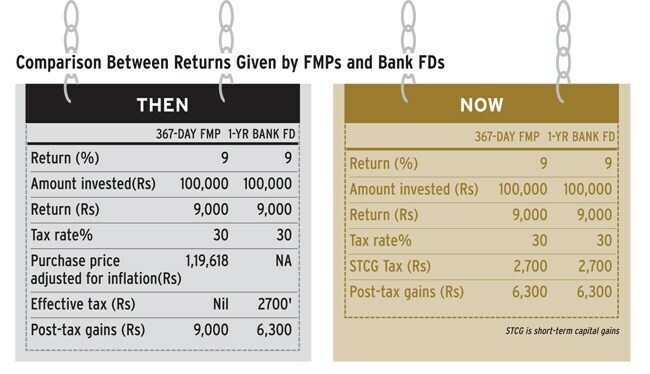 FMPs had a tax advantage over fixed deposits because of the indexation benefit, making gains taxfree. Indexation is adjusting the purchase price of an asset by the inflation rate. This reduces capital gains and, hence, the tax burden. Investors, though, will still be able to avail of the indexation benefit if they remain invested for at least 36 months. So, if companies, which invest a lot in FMPs, redeem before three years, the gains will be added to their income and taxed at their usual tax rate of 30% plus cess and surcharge. In case of individuals, too, the gains will be added to the income just like interest earned from bank fixed deposits and taxed according to the person's tax slab. The new rule applies to all categories of funds which are treated as non-equity for taxation. These include all funds that invest less than 65% money in Indian equities. Therefore, apart from all debt fund categories, the change will impact gold funds, international funds and fund-of-funds. These funds together account for 75% of the industry assets under management of around Rs 9 lakh crore. However, the category of funds likely to get hit the most is FMPs, as over 90% money in FMPs is in schemes whose tenure is between one and three years. FMPs with tenures of more than 365 days help investors benefit from double indexation. Such FMPs are bought in one financial year and mature in the third financial year. The purchase price is, therefore, adjusted for inflation twice (one in each financial year). This significantly reduces capital gains. In fact, the indexed cost is generally higher than the redeemed value, which results in a virtual loss and makes gains tax-free. That is why FMPs were providing tax-free returns of 8-9% annually and, hence, giving a competition to bank fixed deposits. FMPs account for 15% of the industry's assets under management. "A lot of money from high net worth individuals will find its way from mutual funds to bank deposits as the proposed amendment will take the sheen off debtoriented mutual funds. However, liquid funds and other short-term funds may still remain attractive as shortterm deposit rates tend to be meager," says Amit Maheshwari, partner, Ashok Maheshwary & Associates. But the future looks bleak for this category of funds. "It seems FMPs as a category will survive only in the three-year-plus segment," says Vikaas Sachdeva, CEO, Edelweiss Asset Management. What many fear is that this change will apply with retrospective affect from April 1. There is no clarity from when the new rates will be applicable. At present, most are assuming that it will come into effect with retrospective effect, which is unfair. Some think it will be applicable from the date of the budget speech, that is, July 10. Experts feel that as the tax arbitrage is gone, FMPs will now have to deliver better returns to differentiate themselves. "Unless the instruments in FMPs are chosen to deliver returns that are higher than the fixed deposit rates, it will be tough for FMPs to differentiate themselves from fixed deposits. Hence, the future of FMPs, especially those with tenures of one-three years, is in question as of now," says Vidya Bala, head of mutual fund research, FundsIndia.com. The new tax rates will also apply to liquid funds and ultra short-term funds. But inflows in these funds are unlikely to be hit as people anyways park money in these funds for only a few days or months. These funds together account for around 37% of the mutual fund industry's assets under management. Companies park money in these funds for a few days or months. Since there is no change in the short-term capital gains tax rate, any impact on these two categories is unlikely. "Liquid funds offer investors the convenience of parking funds for even a day, which an investor may not want to compromise despite having to pay tax at a higher rate. Also, ultra short term funds will continue to find favour as long as very short-term bank deposit rates don't inch up dramatically. Between the two categories, we believe that the liquid category will be the least impacted by the budget measures," says Lakshmi Iyer, chief investment officer (debt) and head of products, Kotak Mutual Fund. However, if anyone wants to invest in debt funds or FMPs for the long term, that is, for over three years, these products are still more tax efficient than bank fixed deposits because of the indexation benefit.